Before taking on your gorilla safari tour in Uganda, we invite you to get briefed more about these amazing creatures with their interesting facts. Gorilla trekking in Uganda is considered to be one the most satisfying activities done by tourists in Mgahinga national park. This park has only one habituated gorilla family known as “Nyakagezi” originally consisting of 9 family members, 2 silver backs, 3 female adults, 2 infants and 2 juveniles. Gorilla trekking in Uganda can some if the times be tiring and occasionally cover the whole day as the guide takes you through this amazing world and also giving you information on their ecology and wild behavior. There is a good chance of spotting these gorillas of Mgahinga national park however success is never guaranteed as these creatures are wild animals, never fixed in their daily routine and finding them requires a guide with extra skill, experience as well as luck. For the travelers on Gorilla Safari in Uganda, before setting of for the actual gorilla trekking activity, the guide will always suggest how long this activity may take. However while moving do not hesitate to ask the guides to slow down their pace in case they are moving so fast or if you need to rest. This guide will not leave you behind. The daily routine of a mountain gorillas in Uganda includes foraging early in the morning and have a rest during the late morning and midday. In the late afternoon they forage before they rest at night. The mountain gorillas leave their sleeping nests at 6am in the morning except when it’s too cold, that’s when they stay up their nests. Uganda Gorillas don’t have discrete territories and instead they roam in home ranges. When the sources of food are sparse, the ranges between groups also become larger and when there is abidance of food the distance between home ranges become shorter. Gorillas get infected with most of the diseases suffered by human beings as well. It is for this reason that Uganda safari visitors to these gorillas are advised to keep a distance. Respiratory diseases suffered more especially pneumonia are the most frequently causes of deaths of most mountain gorillas. The gorillas basically live on ground and almost 20%of their day time in trees. They climb trees either to play or harvest fruits and rarely jump from branch to branch due to their weight. 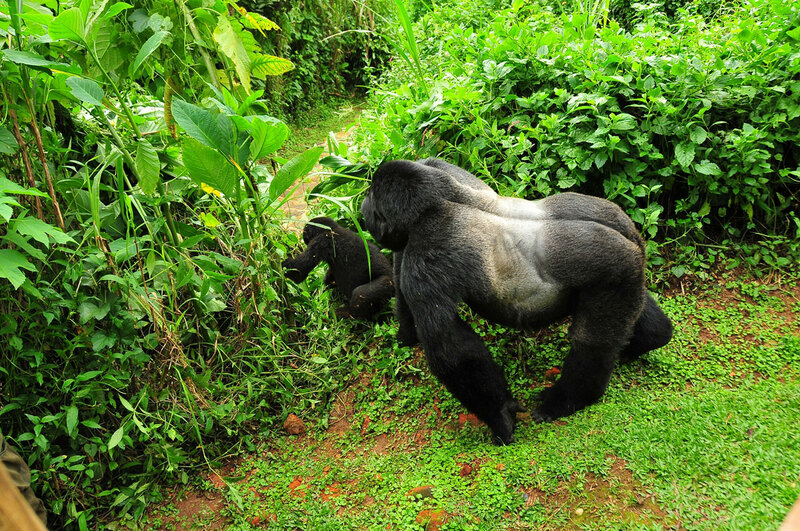 Gorilla trekking in Uganda can be physically demanding, so be prepared well enough. These Gorilla facts prepare you for this safari activity and give you guidance on conservation of the Mountain Gorillas in Mgahinga national park. Please read these Gorilla facts before your tour to Uganda.